You don’t have to spend a ton of time prepping and you don’t have to have a ton of ingredients. This simple recipe for boneless skinless chicken breast will make use of most of the seasonings you may already have on hand and is a breeze to make. 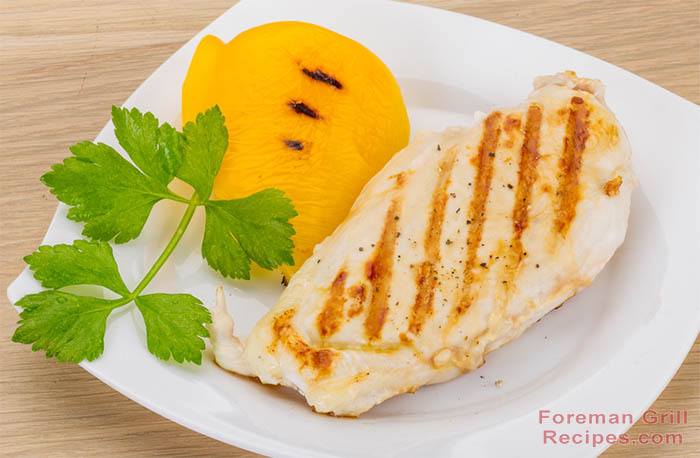 One of the most important things with making boneless skinless chicken breast on an indoor press grill such the George Foreman Grill is to use thinner cuts of meat. Most stores sell thin cuts of chicken breast but you can always slice it in half too. Using a cut of meat that is 1/2″ or less is ideal for these grills. Having it be even thickness is important too. If one end is too thick you can always pound it down. This recipes is great for serving with some vegetables for a wonderful low-carb meal with lots of protein. It’s also great for using in salads. Start with good even cut 1/2″ thick chicken breasts. Lightly coat both sides with olive oil. On a plate mix pepper, salt, paprika and parsley flakes and place chicken in mixture to generously cover both sides. At this point, take a fork and pierce the chicken several times. This will help distribute the seasonings as well as help tenderize the meat. Preheat you George Foreman Grill for at least 5 minutes with the lid closed. Preheating is very important. Use high setting if your grill has it. Once grill is ready, place meat on grill and close lid. Grill for about 5 minutes then rotate meat 1/4 turn. Grill for another 2 minutes then check for doneness. Make sure there is NO pink in the middle. Grills can vary in temperature so you may have to adjust cooking times but this will give you an excellent starting point. You’ll be amazed how wonderful this chicken can be. Love the foreman!!! Chicken breasts to chicken quesadillas. Steak, corn on the cob, French fries, so on and so forth. A true life saver!!! !